Seafood is fast food, and a spicy dish of delicious shrimp is about as quick, easy and flavorful as it gets! It is the quintessential meal for those days that are hectic beyond imagination, you know, the ones that leave you frazzled without too much time left to spare for family, relaxation or healthy eating. But there is no need to fall for take-out with empty calories, when you can invest just a little bit of your leftover energy in creating a meal that nourishes you, inside and out. In summertime, we cannot resist a plate of grilled garlic shrimp skewers with watermelon salsa out on the deck with a cold drink and close friends, but some days call for more “uncomplicated” matters – such as stirring a handful of spices in a bowl, coating the shrimp and frying them until they smell amazing… A perfect dream right? No fuss, nutrient-dense food with just a few minutes of preparation. Plus, shrimp provides an excellent source of protein, Vitamin D and iodine in your diet. 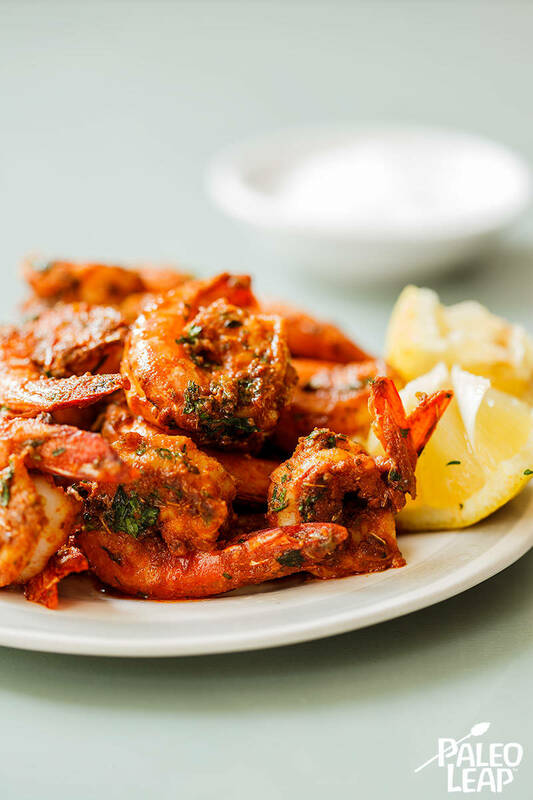 Not only that, shrimp contains powerful antioxidants that help to slow the effects of aging, so it is great for your skin too, not to mention that shrimp are rich in zinc – now your hair gets to enjoy some of the benefits of your meal too! Add even more restorative nutrients to your meal by means of a salad of mixed greens, fennel and red pear, and soon it will begin to feel like your busy day really was wonderful after all. In a bowl combine all of the spices and mix well. Sprinkle the spice mixture over the shrimp and coat the shrimp in the spices. In a large frying pan melt the coconut oil over medium-high heat, then fry the shrimp until cooked through, about 2-5 minutes.